Note the Shuffleboard Sign!! Click on the pic. Gary Pipher Speaks: I am sure everyone reading this little article has at sometime in their travels , came across catchy slogans and memorable monuments at the entrance to towns and villages across Canada. Flin Flon Manitoba has Flinta Flonti Flataby ( or what ever his name may be) Sudbury has the big nickel , Wawa has the Canada Goose and the list goes on. 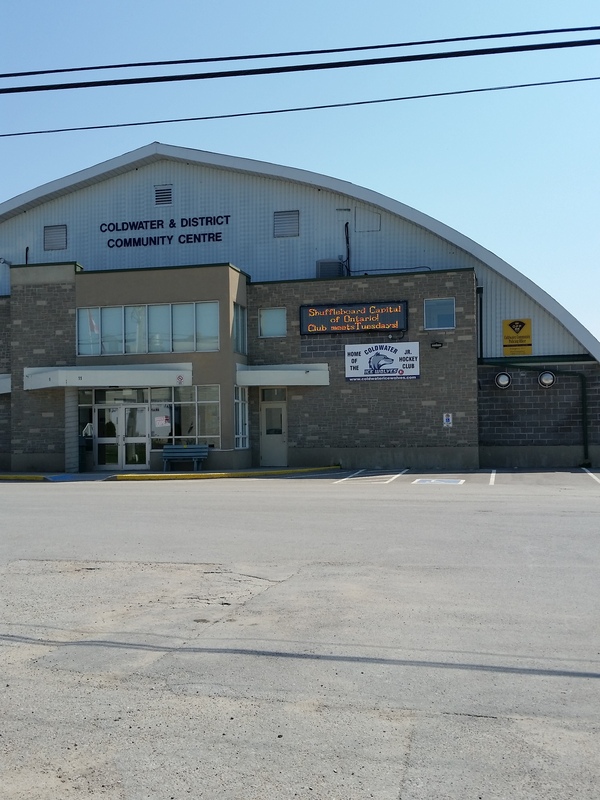 But thanks to Rendal Bilton of Wellington Center in declaring Coldwater as the Shuffleboard Capital of Ontario, that catchy little phrase can be seen in many places. Coldwater as you probably know is the last stop for many tourist on the way to their summer cottage and they make a last stop to pick up supplies and refreshments . One couple who stopped by to shop in the Village was overheard in a local hardware store wanting to know just what the “H” Shuffleboard was all about and how does a village go about being made the capital of what ever the “H—” Shuffleboard may be???. The store clerk said it has always been one of our best kept secrets and she might have to try the game of shuffleboard to see for herself. She was apearantly rather young , so we may have to wait a while for her to sign up and he also thought she may have been sampling her refreshments early. 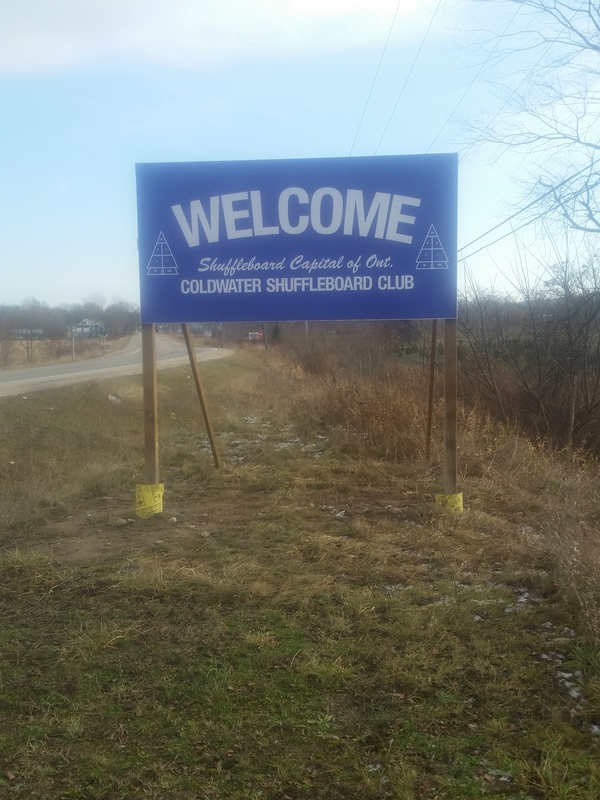 Advertisement for Shuffleboard must be getting out through social media and flashing signs because we have increased our membership this year by 45% over last year. We have lost our local newspapers as many other towns have and of course we have lost that old fashion way of advertising and getting the word out . However it appears many of our new computer savy members spend their winters in Florida and more players are signing up every day so all is not lost as a result of the newspaper publishers closing shop. If you click once on pic to enlarge the photo of the front of the Municipal Arena, you will see just what I mean. Please don’t take my word for it , drop by and see for yourself. Coldwater will be hosting a three day CNSA any doubles tournament on July 24/25/26. ⛺🌅🚎. Come early and pitch your tent or park your camper you are always welcome in Coldwater. Lunches will be available each day of the tournament and a banquet on the evening of July 24. Advance reservations are requested for the caterer to prepare sufficient meals. This entry was posted in CNSA General, CNSA HISTORY. Bookmark the permalink. 2 Responses to Ever Wonder How, and Why, Coldwater Became the Shuffleboard Capital of Ontario???? Coldwater will always be special to us.